Flickback Trivia Challenge Playing Cards are actually 2 decks in one: a trivia deck with different questions for each year, and a regulation playing card deck complete with 2 jokers. The 52 different illustrated questions in each deck range from easy to challenging, and each question is specific to the year. Topics include entertainment, culture, world events, celebrities, sports. Answers are supplied on the separate answer key card included with each deck. 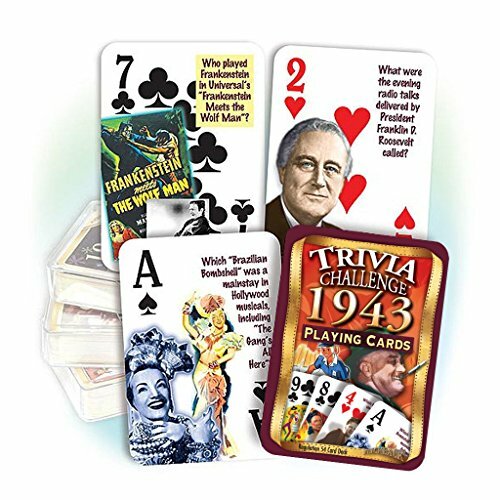 Trivia Challenge Playing Cards make a perfect gift for birthdays, reunions or anniversaries. Can you name the Rolling Stones frontman, born on July 26th, 1943? Or which popular singer caused near-hysteria among "bobby-soxers" when he performed at New York's Paramount Theater? Test your knowledge or quiz your friends with these 52 colorful illustrated 1943-themed questions about the year's celebrities, sports, events, movies and music. A Key Card is provided with all the answers, as well as a pair of Jokers loaded with fascinating sports stats. Plus, the cards double as a regulation playing card deck! 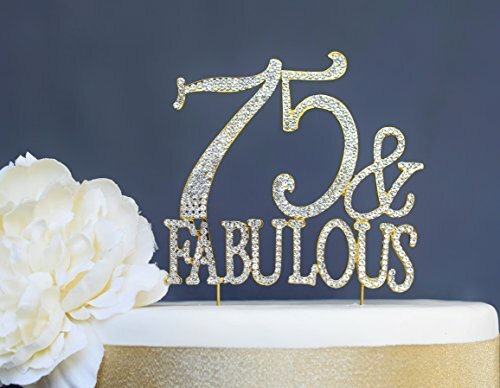 This beautiful 75 & Fabulous rhinestone cake topper adds a fun, classy sparkle to your birthday cake. The topper also makes a great keepsake for after the party! Premium crystal rhinestones are set in quality gold metal alloy backing with a mirror finish. Crystal rhinestones are securely fastened, so no need to worry about losing any during shipping! The 75 & Fabulous measures approximately 5" tall and 5.25" wide. The prongs measure approximately 4.5" long, and can be easily trimmed to your desired height. 100% money back guarantee. 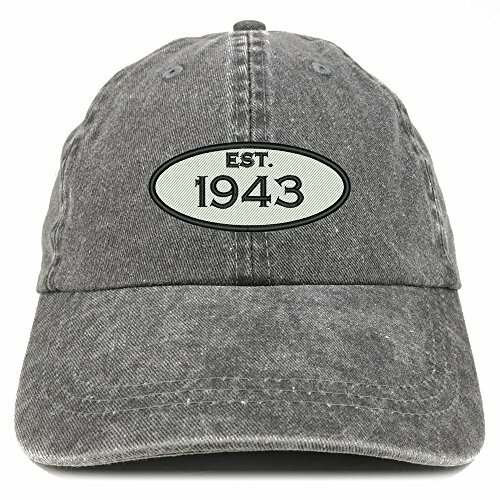 Order includes 324 black and gold 75th birthday stickers. Use these self-adhesive labels on Hershey's® Kisses candy or birthday party invitation envelopes as seals. Order includes all 9 designs pictured. 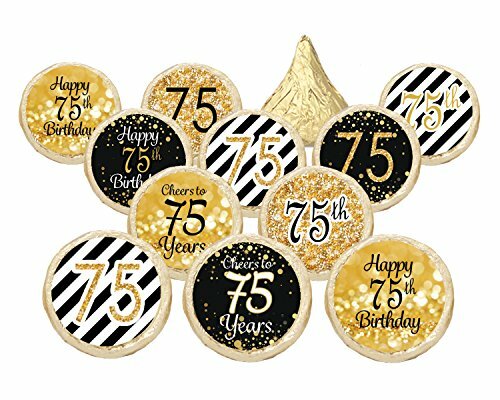 These decorative stickers are easy to peel and stick to most small candy wrappers for fast and glitzy 75th birthday party favors. Candy and other accessories not included. Always faux glitter - for the glittery look without the mess of actual glitter. 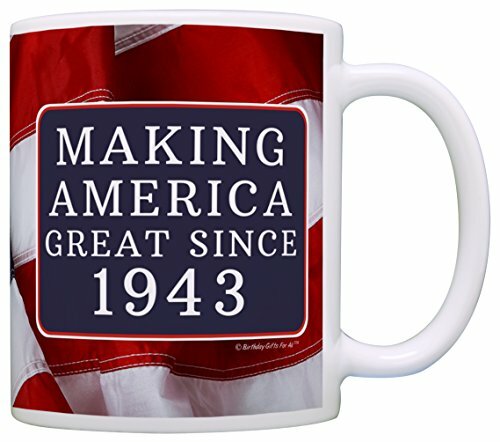 Distinctivs® products are proudly Made in the USA. Get the Best for the Best: With such a momentous occasion, it's worth the splurge. 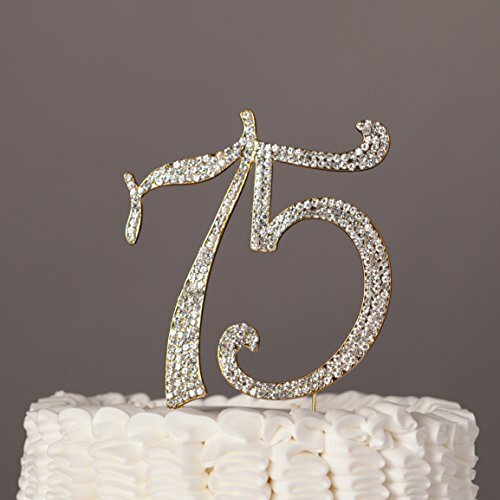 With its sparkles and metal setting, this piece makes the perfect dessert top for those celebrating their 75th and will certainly make a statement! Quality Is Worth It: With so many plastic gimmicks and candles on the market, this high quality metal-alloy piece truly provides grace to an already beautiful dessert. Customize the Height: Whether it's a sheet-cake or multi-tiered design, this piece will fit atop any type of dessert. The prongs can easily be snipped down to the appropriate height so that the number rests right on top without anything showing below. 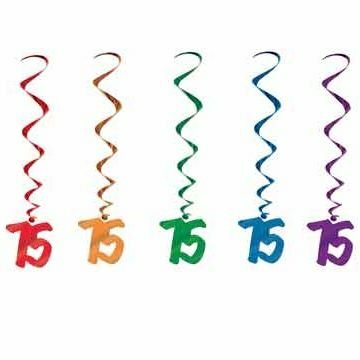 Make a Statement: The big 7-5 is a big deal, and this large 5 inch tall piece will make it clear that it's time to party. Añadir elegancia a su partido : Con un brillo especial y el estilo que llame la atención , esta pieza elevará cualquier postre. 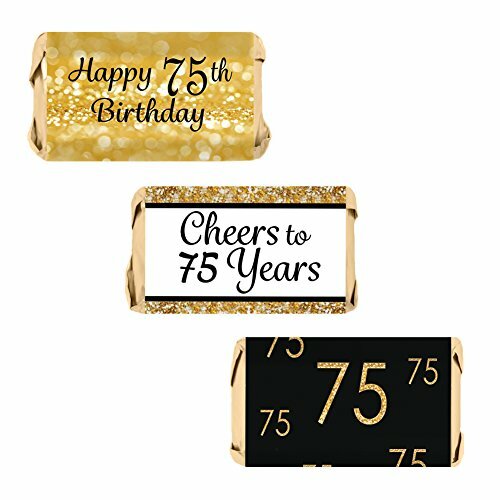 Celebrate this special birthday milestone with these gold and black 75th birthday party favor stickers that will be a sure hit at your party. Designed to wrap perfectly around Hershey's® Miniature Bars (candy not included) for a simple and easy birthday party favor or table decoration! Each package includes 54 self-adhesive stickers for you to place on the Hershey's miniature candy bars of your choice.This is faux glitter, it's printed to look like glitter, but it is not real glitter (No Mess!). Each sticker measures 2.5" by 1.56" to completely wrap around the mini candy bars. These do not fit Hershey nuggets, only designed to fit Hershey Mini Bars. All of the stickers are laser printed so no need to worry about running or smudged ink. Our stickers are packed as flat sheets of stickers to prevent curling of the stickers. Every Package has all 3 designs included: - 18 Happy 75th on Gold Glitter Background With 75th Lining The Sides stickers - 18 Cheers to 75 Years with Glitter Border on Black and White Diagonal Background stickers - 18 Glitter 75 In Various Sizes on Black Background With Gold Confetti stickers Please note: Candy NOT included. Hershey's® Miniatures is a trademark of the Hershey Company. 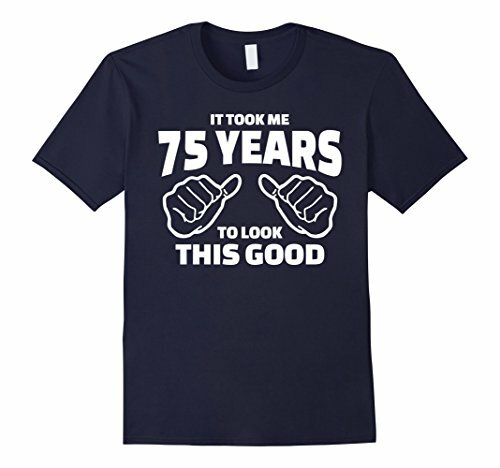 Compare prices on 75th Birthday at ShoppinGent.com – use promo codes and coupons for best offers and deals. Start smart buying with ShoppinGent.com right now and choose your golden price on every purchase.